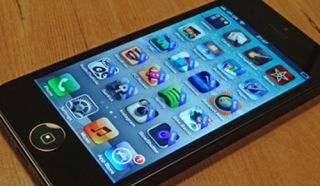 Apple considering 4.7in and 5.7in iPhone screens | What Hi-Fi? The next-gen iPhone could look very different to the iPhone 5 according to rumours, with Reuters reporting Apple is considering two new iPhone models, one with a 4.7-inch screen and one with a 5.7-inch screen. The big-screen iPhones – iPhone 7? – are set to launch next year, following the rumoured launch of an iPhone 5S or iPhone 6 in September this year. Apple is also considering new iPhones in various colours, with these new phones set for release over the next 12 months, if you believe the reports. The move is seen as an effort by Apple to combat Samsung's increasing success in the smartphone market, the Korean company having released the hugely successful Galaxy S4, with a 5in screen, alongside a whole host of other models (and more to come next week at Samsung's Premiere 2013 event). The imminent release of the Galaxy S4 Mini, which in fact has a larger screen than the iPhone 5, only serves to highlight the current discrepancy in screen sizes between the two biggest phone manufacturers. Samsung has overtaken Apple in market share – selling four Galaxy S4 phones a second – helped by the popularity of its bigger screens and an array of products at different price points; something that Apple doesn't have. Reuters reports that sources close to Apple say Apple will rectify this by releasing two new models, one with a 4.7-inch screen and one with a 5.7-inch screen. The iPhone 5 was the first iPhone to veer away from a 3.5-inch screen, which Steve Jobs once said was, "the perfect size for consumers". Times have changed, however, with consumers lapping up larger phones and "phablets" such as the Galaxy S4 and the Galaxy Note 2, both of which have screen sizes of 5 inches or more; significantly bigger than the iPhone 5. Apple is expected to launch two new models this year: the iPhone 5S with fingerprint technology and a cheaper version of the same model in an array of colours (possibly as cheap as $99), which is expected to come in plastic casing as they look to rival Samsung's cheaper prodcuts. Many believe that Apple needs a cheaper iPhone if they're to see an increase in sales in the likes of China and India, with the former being the world's biggest smartphone market – and set to grow 48% this year.